Judging a book by its cover is usually pretty frowned upon, but in the music world, judging an independent album by its album cover can sometimes - sadly - give the listener an accurate assumption of the album's quality. 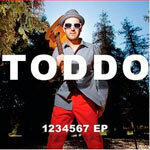 Taking a look at the album cover of ToddO's new EP, 1234567, one may not expect too much from the Jason Mraz-esque gentleman wielding his acoustic guitar. However, upon digging into the music itself, one would be pleasantly surprised. "Dave" starts the whole thing off with an upbeat pop rock track featuring a pretty singable chorus. Todd's voice seems a bit weak in this track, but it doesn't stand out too much. The track is laced with jingle bells, piano, light percussion and some whistling, as Todd sings about wanting to be like King David. "Freedom In You" follows, switching it up instrumentally; Todd sings to Jesus over the accompaniment of a ukelele. The drums come in and turn it into a mild rock song just before they're joined by some synth and electric guitar. Just two songs in, and we already get to see the diversity that ToddO is able to offer without the sounds clashing. "Made" keeps the ukelele-rock going while also diving into radio-friendly, Goo Goo Dolls/Train-type pop. Todd blends the styles together so well that he manages to create uniqueness out of the ordinary. Still, I can imagine "Made" getting airplay on K-Love or other similar stations. ToddO rocks out a little more in "Hallelujah Chorus," which features some heavier drums, more electric guitar and slightly more commanding vocals. There's still some piano and a little bit of what sounds like a glockenspiel, but it's still heavier than the rest. The lyrics are a little odd, as they start off as if describing how an anthemic worship song is written, but the concept seems to go on a little long as he starts mentioning verses six and seven (I don't know a lot of songs with that many verses in them). I like the idea of the lyrics, but I'm not sure if it worked as well as Todd intended. "No, No, No" tones it back down into a piano pop song, reminiscent of a Ben Folds or Jars of Clay track, but with more of a modern pop spin. It leads very smoothly into "Who Is This?," which sounds like a direct relative of "No, No, No," musically speaking. There's more pop rock than piano pop, and lyrically, it's a reverant song, with Todd singing about God's promise that He'll always be there. He sings, "A knock at the door and who will find me? My boat left the shore and who will walk to me? Ah, selah. Who is this God who loves me? Who is this One who knows me and loves me all the same? Who calls to me from history and meets me everyday? Who is this? Ah, selah. Hallelujah." "No More In Heaven" finishes things off with an up-tempo pop rock song about the joys of life in Heaven, where there will be "No more tears, no more bills to pay, no more worry in Heaven, no more regrets, no more pain, no more lonely in Heaven." It's borderline pop punk, but that beautiful ukelele finds it way back in and is played over the electric guitar. It's a weird combination but it sounds terrific. Listening to the music offered up on 1234567, it would be very hard to tell that this was an independent album. ToddO recorded wrote, produced, and recorded the entire thing (except the drumming) in his own studio, and it sounds as good as, if not better than, some major label recordings you'd hear today. ToddO's got some creativity and musical skill, and if you like any of the bands I've mentioned here, you should check out his EP, which is free at NoiseTrade and Bandcamp. Jesus freak Hideout (Scott Fryberger): You played almost every instrument on your new EP. What are your favorite instruments to play? ToddO: I thankfully had the expertise of two incredible drummers, John Mole and Matt Arcaini, as well as Bill Dalo on trumpet. But yes, other than that, I played everything else. It's really hard to narrow down a favorite instrument because they are all so different and important in their own ways. I love the ukulele for the natural tones and the evocative nature of it right out of the box. The electric guitar is played on there quite a bit, though it is hardly recognizable as such sometimes. I use all sorts of effects and amp modeling to get strange and wonderful tones - which is huge fun. Believe it or not, if I had to narrow it down to just one instrument, I would say the bass. There is power in the bass unlike any other instrument. And it's ironic because casual listeners might not even hear the bass distinctly. But I think that as the bass goes, so goes the song. In other words, it's such a beautiful and powerful force that it channels the energy of the song. ToddO: My mom thankfully put me in guitar lessons at the age of 8 where I learned a few chords and that was it. I never got much better as far as technical ability. I still can't play solos or lead parts. I don't read music. Along the way, of course, having amassed a huge record collection and listening to a lot of music, my musical vocabulary and ability to express it has increased a little so that now I feel comfortable producing my own records. I feel grateful that I can hear a sound in my head and go right to the instrument and add it as an ingredient to the final mixture of tones. How long have I been a musician? All my life so far. JFH (Scott): Have you ever released any music before 1234567? ToddO: A couple bands I was in a long time ago released demoes, and I myself as ToddO released a couple singles on iTunes but nothing has been released as widely as 1234567. That being the case, I've got a lot of music in store that I'm going to be putting out, God willing. In fact, as soon as this project is done and birthed, and some touring has been done, I've got much more creativity to unleash that I can barely contain. Maybe I'm feeling like I have to catch up a bit. JFH (Scott): Why the title 1234567? Any special significance, or is it just a name? ToddO: There are seven songs on the EP. And I liked the way it looked when written out "1234567 EP." It just looked different when compared to other album titles so I went for it. Plus I couldn't come up with anything catchier. JFH (Scott): The lyrics to "No, No, No" seem like they may have a deep story behind them. Care to share? ToddO: The verses do try to encapsulate little vignettes of my life, kind of like a collage. Some of my songs have a narrow focus or singular theme of what it's about. Other songs, like this one "No, No, No," talk about a number of things. I'm talking about romance and doing things the wrong way, unfortunately, as far as sexual purity before marriage. I'm talking about having a son and other poignant moments of my life. And finally, I'm saying "no" to taking anything for granted. JFH (Scott): 1234567 is a free download; are you planning on giving away all of your music for free? ToddO: Probably. Believe me, I think music in general is highly valuable - way more than $.99 or whatever iTunes charges. I actually wrote a whole blog post about why I give away my music for free (http://www.songsbytoddo.com/blog/Why-I-Give-My-Music-Away-For-Free.asp). But basically there are new rules in the music industry. Granted, the new rules are not 100% clearly defined to the extent that you can, say, computer model them or something. But there are new realities that are as plain as day to me. For example, retail is not coming back. My records will probably never be on any store shelf. Sure, there's space just enough for the top of the top of the tier. Like when U2 puts out their next album it will be in Wal-mart for sure, or Adele or Lady Gaga. But for the rest of us, those slots are not available. But thankfully, the internet came along and made all that irrelevant. We have things like iTunes and Amazon and CD Baby. But again, that model is upset too because we have YouTube and BiTorrent where anybody and everybody can rip songs without paying even one red cent - let alone .99 cents - to own your music In my opinion, charging money for music only serves to quash the viralability - if that is even a word - of a new artist. Why try to fight the flow of the stream - ie. the internet and its free exchange of content? That's like trying to swim backwards up Niagara Falls. A much better solution is to try to harness the internet's tools and ethos and build an audience directly by providing the music for free download in exchange for your email address and zip code. The new model looks more like NoiseTrade.com and other such sites. And artists who are already doing extremely well within the new paradigm are like Josh Garrels, Jonathan Coulton, Keller Williams and others. Do I care to make any money ever at this? Sure. If you want to see me in concert or have the physical CD in your hands or have a t-shirt on your back or a sticker on your amp, et cetera - that is going to cost you. JFH (Scott): Do you have any desire to sign to a record label? ToddO: I have a desire to build a large and long-term relationship with fans of my music. To the extent that a third-party entity like a record label could creatively help me in that regard is a welcome conversation. It would have to be a highly progressive label that wanted to be unique and creative as far as career building within today's context of the internet versus retail and free versus fee for downloads. But as a general rule, I have no interest whatsoever in "getting signed" so that I can feel validated by "the industry." There is no "Mr. Big" out there that I care to impress. Some of my friends have signed to labels recently and - in my opinion - they are not good deals. I'm not trying to sound cocky, like I don't need anybody, or anything. But let's be honest... at this stage in my career there is no bigger champion of my musical career than yours truly. Thus, I release my music through my own record label Hembot Recordings. ToddO: Lately - as in the past couple years -- God has been teaching me all about resting in Him and being patient in His timing. God is never early or late, but right on time. Sara Groves - a very talented artist I'm sure your readers are well aware of - says something that I think is smart - that we can work out things in our flesh, working our fingers to the bone so to speak. That's how the devil would have us. Tired and spent; like rats in a race. But there is another way. And that is the way of simply resting in God. In being still and not hurried or worried or stressed. Trusting and depending that He is in control and that I don't have to be. Sort of like a pregnant mom can't rush out the baby, it just has to come all on its own. I like that. And I needed the lesson.